Involving the public in scientific-based conservation projects is an important initiative for The Orianne Society. It provides a direct link between our projects and citizens who are interested in conserving reptiles and amphibians. Our Citizen Science Initiative allows us to collect important data from a wider area than we would be able to by simply using Orianne staff. Orianne’s current citizen science projects include special place-based events, Indigo Days and Places You’ve Never Herped, and broader-scale data solicitation projects that will result in a comprehensive herpetological database. This database will allow the public to enter data at any time and thus have the opportunity to continually interact with the organization and contribute to our conservation efforts by sharing valuable scientific data. We are also now taking steps to develop a global herpetological database that will be built through a combination of focused projects addressing a specific citizen science question, as well as a broader database meant to store opportunistic observations from the general public. This database structure will not only provide us with continuous data from the public, but it will also give us the flexibility to immediately gather data for herpetological conservation questions and initiatives as they arise. We have developed a project called Snapshots in Time to compile citizen-collected data. Our initial efforts have been focused on collecting data for Spotted Salamanders and Wood Frogs, but in upcoming years, we will be adding additional species to this project. We are also assisting with status and distribution surveys for three declining snakes—the Florida Pine Snake (Pituophis melanoleucus mugitus), Southern Hognose Snake (Heterodon simus), and Eastern Diamondback Rattlesnake (Crotalus adamanteus)–that are associated with Longleaf Pine ecosystems and are collecting data for them as part of our Snakes of the Longleaf Pine project. We have worked to educate the public about the value of reptiles and amphibians at outreach events and have reached over 70,000 people to date. We have also conducted targeted species surveys, citizen science and bioblitz events and have identified 85 Partners in Amphibian and Reptile Conservation Areas (PARCAs) across five states. Our overarching goal for our Citizen Science Initiative is to continue educating the public about the value of reptiles and amphibians. 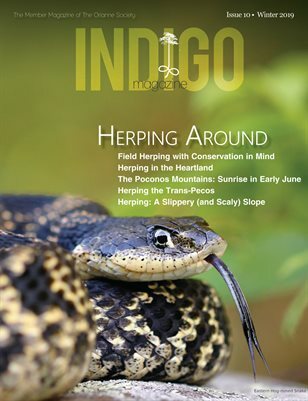 As part of our educational opportunities and data collection projects, we plan to expand our annual and bi-annual events (Indigo Days and Places You’ve Never Herped) for our members. We are also working to create PARCA plans to consider climate change and population growth. Our Places You’ve Never Herped events provide our members a chance to meet fellow herpers at various sites. At our Indigo Days events, Orianne supporters have a chance to visit the Orianne Indigo Snake Preserve among other activities. This task team develops guidelines for identifying areas of high herpetological diversity or with the presence of rare species across North America.